Tropical Depression Fung-Wong skirted the coast of mainland China and is moving through the East China Sea. NASA's Aqua satellite captured cloud top temperature data that showed strongest thunderstorms were stretched out as the storm continues to look more frontal in nature. 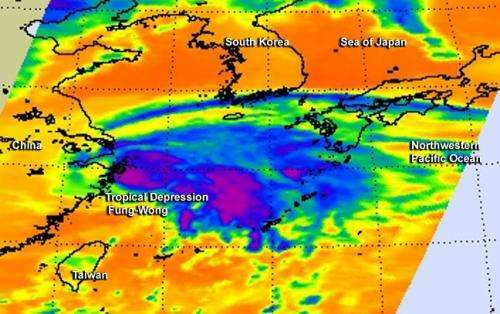 When NASA's Aqua satellite passed over Fung-Wong on Sept. 22 at 1:23 p.m. EDT, the Atmospheric Infrared Sounder or AIRS instrument read cloud top temperatures. AIRS detected strongest, highest storms, those with the coldest cloud tops stretched out from northwest to southeast giving the depression an appearance more like a cold front than a depression. On Sept. 23 at 1500 UTC (11 a.m. EDT) Tropical Depression Fung-Wong had maximum sustained winds near 30 knots 34.5 mph/55.5 kph). It was centered near 32.8 north latitude and 123.5 longitude, about 351 nautical miles west of Sasebo, Japan. It was moving to the northeast at 11 knots (12.6 mph/20.3 kph). On Sept. 23, the Joint Typhoon Warning Center noted that there is a defined center of circulation near the southern edge of the large area of frontal clouds. There was also very limited thunderstorm development pushed over the northeastern quadrant by wind shear. That wind shear is pretty strong, blowing at up to 30 knots (34.5 mph/55.5 kph). Fung-Wong isn't long for the world as it is also interacting with a frontal system located over the West Sea and South Korea. The storm has already started converting to an extra-tropical storm (the core of the storm is going from warm to cold). Fung-Wong is expected to turn east-northeast toward southern Korea and gain frontal characteristics.